Oscar Wilde’s An Ideal Husband is an excellently funny and well-written look into a world unlike our own, but like many plays of the era, needs a near-perfect performance to suit the solid script. The opening scene of this performance immediately told me what kind of performance I would see – the delightfully witty Marchmont and Basildon, played by Lara Orriss and Georgina Jackson respectively, put on an excellent opening with a perfect blend of cartoony over-the-top dialogue and believable portrayals of their characters. The set was simple but effective at allowing characters to easily leave and enter scenes in an attempt at keeping the pace up. As the play introduced more of the cast, it soon became clear that the supporting cast was far and away the strongest aspect of this production; Orriss and Jackson are a hilarious comedic duo. Tom Wilson put on a stellar performance as three drastically different and entertaining characters and Lord Caversham, played by Andrew Holt, was a delight to behold as he hammed up his serious curmudgeonly attitude in every single one of his scenes. 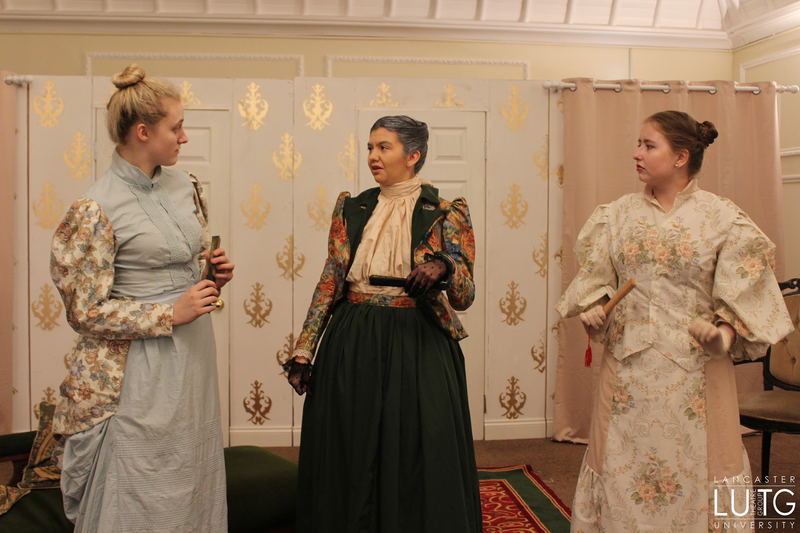 Even Mabel Chiltern, played by Tolia Uwalaka, and Lady Markby, performed by Hannah Basnett, had their moments where they managed to get the whole audience laughing. 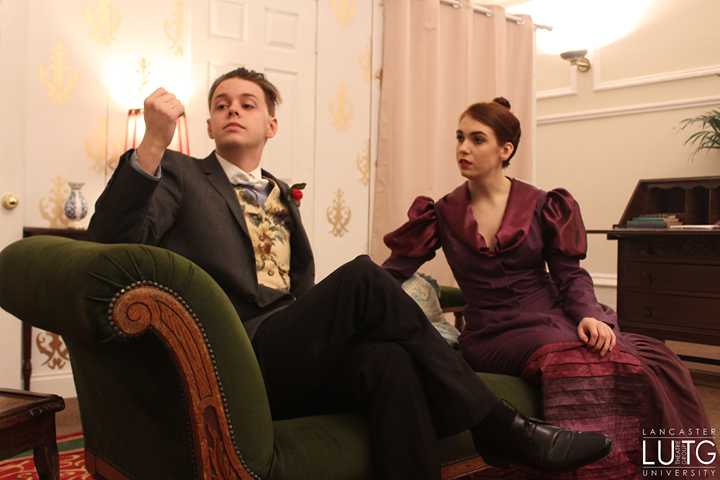 In contrast, the more straight-laced Robert and Gertrude Chiltern, played by Isaac Rolfe and Ella Hughes, felt somewhat out of place in this wacky world of politics and parties. They are hardly weak actors, but these roles were perhaps not best suited to their talents. Mrs Chevely, presented by Rose Briggs, was a joy to watch. Her personable performance and complete command of any scene she was in kept me engaged, and she served as the perfect blend of comedic happenstance and serious plot, making us laugh one moment, and on the edge of our seats in the next. Of course, the audience distinctly felt her loss when she was not present – some scenes dragged on without her. Most notably, a scene where Markby is talking about her husband to Marchmont and Basildon was almost torturous to watch, having no movement or direction from the characters. Having Marchmont and Basildon sigh to the audience would have done much to ease the boredom. When Markby leaves and the two characters mention how boring she is, the audience laughs; a funny observation, yes, but the audience is only laughing because they, too, had to suffer through the swathes of dialogue. This aspect wasn’t the only scene with too much talking and too little direction – the excessive dialogue is characteristic of Wilde’s work, but a good performance understands this and uses direction to keep that dialogue interesting. The show was stolen by Kyle Andrews, playing Lord Goring. His performance was charismatic, appropriately severe or funny as the scene dictated, and fun to watch. Andrews’ charm and style took the show’s tepid first half and delivered an enjoyable second half with plenty of scenes that allowed him to shine. However, for every scene with Goring, there was a scene without him, and the pace of the play entirely stuttered when it was time for the main characters to discuss the real plot. I would have happily watched another hour of Phipps, Goring and his father engaging in antics with Marchmont and Basildon; it felt like the main plot was getting in the way at times. Not a bad show, but certainly one that asks you to switch off during dull scenes while you wait for the more exciting characters to capture your attention once more.